Background: Monoclonal antibodies have been proven to deliver significant contribution in health industry for the development of both therapeutics and diagnostics. Efforts have been made to achieve immunoglobulin with high antigen specificity and stability. In this regard, smaller fragment of antibody has been constructed as an alternative of full immunoglobulin molecules due to the feasibility of recombinant production in various host cells. Antibody fragments are that part of an immunoglobulin which can form a complete epitope binding site and also retain the binding efficiency and accuracy of a whole antibody. However, the effector functions cannot be accomplished by antibody fragments alone as they lack Fc region. Hence, full antibody is constructed by fusing Fc domain of a human antibody. Nevertheless, to find an antibody with high antigen specificity and stability is still a big challenge. Conclusion: Recent protein engineering techniques have enabled many options of modification and tailoring of antibody fragments for better stability, specificity and pharmacokinetic properties. 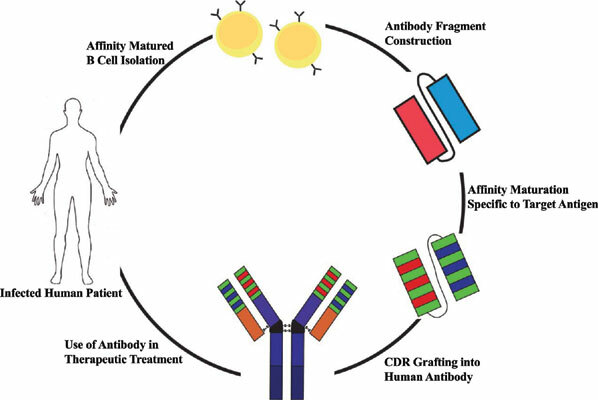 This review focuses on the latest techniques applied for the construction of antibody fragments, recent developments toward affinity maturation and applications of recombinant antibodies. Antibody fragment, antibody engineering, therapeutic antibody, affinity maturation, single chain variable fragment, recombinant antibodies.